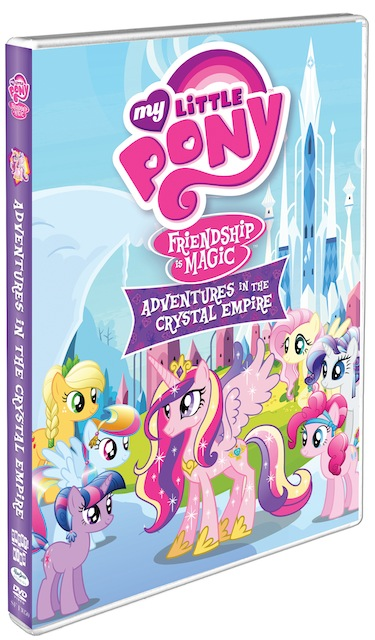 My Little Pony: Friendship Is Magic – Adventures in the Crystal Empire is coming to DVD December 4th from Shout! Factory Kids in collaboration with Hasbro Studios! Adventures in the Crystal Empire includes 5 episodes from the beloved Friendship Is Magic series. Bonus features include a sing-along and coloring sheet. In Adventures in the Crystal Empire, a magical empire has suddenly appeared in the arctic north of Equestria, and PRINCESS CELESTIA needs TWILIGHT SPARKLE and her friends to find a way to protect it. While her friends try to keep the Crystal Ponies occupied at the Crystal Faire, TWILIGHT SPARKLE searches for the hidden Crystal Heart that is the key to keeping their empire safe from harm! 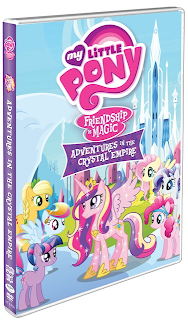 My Little Pony: Friendship Is Magic – Adventures in the Crystal Empire is priced at $14.97 SRP and is now available for pre-order at (insert link). The My Little Pony: Friendship is Magic series is currently airing on The HUB TV Network. Hasbro, Inc. (NASDAQ: HAS) is a branded play company providing children and families around the world with a wide-range of immersive entertainment offerings based on the Company's world class brand portfolio. From toys and games, to television programming, motion pictures, digital gaming and a comprehensive licensing program, Hasbro strives to delight its global customers with innovative, well-known and beloved brands such as TRANSFORMERS, LITTLEST PET SHOP, NERF, PLAYSKOOL, MY LITTLE PONY, G.I. JOE, MAGIC: THE GATHERING and MONOPOLY. The Company’s Hasbro Studios develops and produces television programming for markets around the world. Programming in the U.S. is distributed on The Hub TV Network, a multi-platform joint venture between Hasbro and Discovery Communications (NASDAQ: DISCA, DISCB, DISCK). Through the Company's deep commitment to corporate social responsibility, including philanthropy, Hasbro is helping to build a safe and sustainable world for future generations and to positively impact the lives of millions of children and families every year. It has been recognized for its efforts by being named one of the “World’s Most Ethical Companies” and is ranked as one of Corporate Responsibility Magazine’s “100 Best Corporate Citizens.” Learn more at www.hasbro.com.